Published in the Dover Express, 19 December, 1980. After the driver had abandoned the tram, Trooper W. Gunner, of the 1st Dragoon Guards, who was a passenger, stepped forward to try to stop the car, but without success, and in the crash his feet were so badly crushed they had to be amputated. One of those to send for help was the Tramway Manager himself, whose home was near the scene of the tragedy. A tramcar was soon on the scene to take the worst injured to hospital and others were taken to hospital in further tramcars and ambulances. The Dover Express wrote at the time that it was "the most shocking occurrence that had ever taken place in Dover“ and noted that the public were often to blame for the overcrowding which took place on tramcars. Passengers ignored the efforts of tram crews to try to prevent overloading. A second accident on the River line occurred on September 21, 1923, but fortunately no one was seriously injured on this occasion. Once again the driver complained of difficulty with the brakes, although Dover Corporation said the brakes were in good order. The driver applied power believing that he was applying the electric braking system. In this accident the tramcar overran the worn and rickety points of the old crossover and collided head-on with another car which was coming down Crabble Road. Used properly the rheo-static brake would have held the car quite safely. 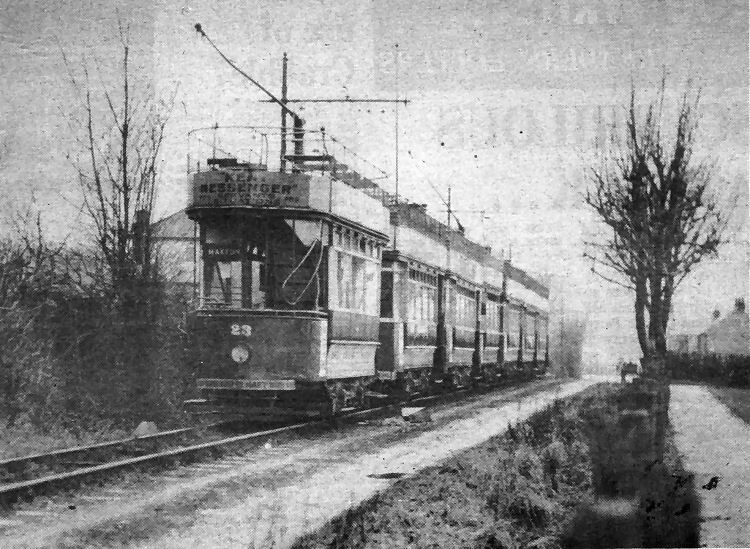 As a result of this accident, however, it was resolved to use only three newly acquired trams, fitted with the latest type of brake, on the River service. Unfortunately this meant that passengers had to change cars at Buckland Bridge. About 1927 nine of the original cars were scrapped but their bodies saw further useful service in a number of ways. Three were used for a number of years as passenger shelters at Buckland, Maxton and River. Others served as shelters or changing rooms at local sports grounds. In 1928 there was the novel introduction of an evening tram post. A collecting box was placed on the dash of the tramcar which was timed to leave River at 8.30 pm. Letters could be posted at any tram stop on either the outward or the inward journey. The letterbox was then handed over to a Post Office official either when the car was passing the general post office or at Worthington Street. Many old Dovorians have fond memories of the trams but for some living along the tramway routes it was a different matter. For many years people had to put up with a lot of noise due to either worn rails or worn wheels on the tramcars themselves. This could have been minimised by the purchase of a rail grinding machine but the Corporation always - appeared to be making economies and avoided such expenditure and left track renewals until forced to scrap the old rails or points. Economies were also made sometimes by purchasing second-hand cars as replacements became necessary. Another criticism was that for many years no timetables were available. The company formed to construct a line to St Margaret’s Bay never carried out its objective although it repeatedly obtained an extension of the time limit in which to use its powers to build the tramway. All hope of constructing the line seemed to fade by the end of the second world war and the company was wound-up in 1952. There was a temporary railway line, used' in connection with building the Admiralty Harbour, which ran above the East Cliff roadway. This linked up with the main Dover and Deal railway line and then ran parallel with the main line to Martin Mill and some people thought that part of this track, which lay derelict for many years, might have been utilised to construct the St Margaret’s line. But it was not to be. One of the light railway company proposals was to take their line to the Bay via New Bridge, Marine Parade, East Cliff, Athol Terrace and a shelf cut in the face of the cliff above the Eastern Docks where the old Dover Undercliffe Syndicate had proposed to construct a marine drive to St Margaret’s Bay. This line would have linked up with Upper Road and Sea Street, St Margaret’s, after passing Langdon Hole and crossing Wanstone and Reach Court Farms. In 1931 when the future of the Dover Tramway was under consideration by the corporation councillors were shown a film about trolley buses by the English Electric Company which, as well as being suppliers of tramcars, was a manufacturer of trolley buses. It was held that the River accidents would never have happened had trolley buses been used on that route and it was also claimed that a trolley bus would be more efficient in Dover than a motor bus. Nevertheless the corporation were not persuaded to introduce trolley buses. Seven open-top tramcars, still advertising the Christmas 1936 Granada Cinema film “To Mary With Love,“ starring Myrna Lay and Warner Baxter, stand on the railway-type sleeper track in what is now Lewisham Road, River, and await their ignominious end — destruction by burning. Considering the predations of souvenir hunters their external appearance suggests surprisingly little damage. None of the windows had been smashed, but then the population of River at that time was quite low. Above a local resident studies the twisted wreck of one of the still burning tramcars, in January 1937.